U.S. To Face Ghana As 'Group Of Death' Play Begins : The Two-Way Ghana has booted the U.S. team from the past two World Cups. The game in the Brazilian city of Natal is a critical one for the Americans to have any hope advancing out of Group G.
In this photo taken with a fisheye lens, members of the U.S. soccer team warm up during a training session the day before their Group G World Cup match with Ghana in Natal, Brazil. It's day five of the World Cup in Brazil. But it's the most important day for the U.S. men's soccer team — it's game day. Tonight at 6 p.m. ET, the U.S. opens World Cup play squaring off against Ghana in the seaside city of Natal. The tiny African country is not particularly a soccer powerhouse. But Ghana has vexed the U.S. — eliminating the team from the past two World Cups. The game is a critical one for the U.S. if it has any hope advancing out of the so-called Group of Death, which also includes perennial favorites Portugal and Germany. (Those teams face off at noon ET today.) A win or tie tonight is essential to give the Americans a chance. 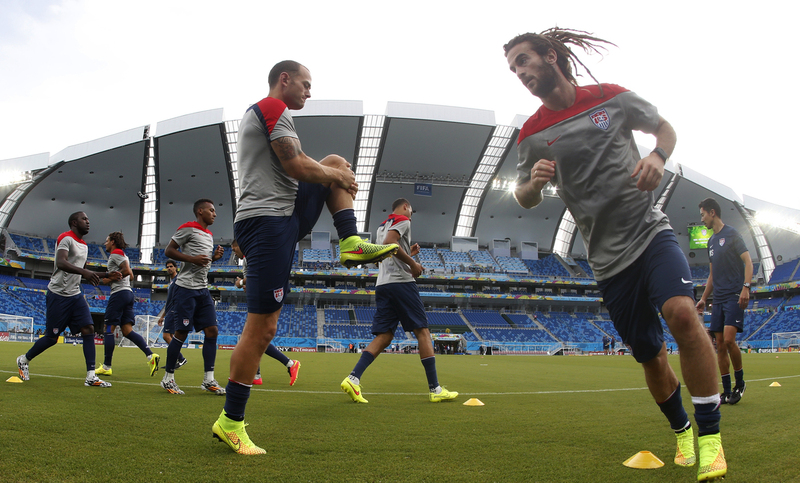 There are thousands of U.S. soccer fans in Natal. One newspaper estimates as many as 20,000 have flocked here. On Sunday, some Americans were milling along the beach and watching other World Cup games at bars and restaurants. Some were wearing team jerseys, while others had U.S. flags wrapped around their backs. The fan club "American Outlaws" held a huge pregame party last night. Hundreds of people were there. Not everyone has a ticket to the game at Arena das Dunas, which seats about 40,000. Still, it could be a pro-American crowd once the whistle blows. Security is visible around town, with dozens of Brazilian troops standing along busy street corners with rifles slung over their shoulders. U.S. Vice President Joe Biden is expected to attend the U.S.-Ghana match. There are also several protests planned in the hours before kickoff. Some people are upset at the sluggish economy and low wages — and the high cost of hosting the Copa. Luckily the torrential downpours of the past three days have stopped. It's soggy, hot and humid here in Natal. But it may be just what the United States needs to advance. It's game day and going to be an exciting one! You can watch coverage on ESPN starting at 5:30 p.m. ET and, for those who like to stay up a little later, on ESPN Classic at 9 p.m. Univision is also streaming the games live on its website.